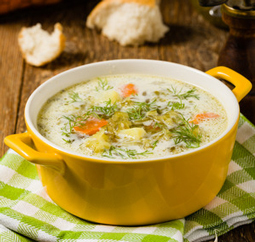 Dill Pickle Soup - A recipe from Savor California, the online showcase for extraordinary gourmet foods and beverages from California. In a large pot, combine broth, potatoes, carrots and butter. Bring to a boil and cook until the potatoes are tender. Add chopped pickles when potatoes are almost done. Vigorously whisk 2 Tablespoons at a time of the sour cream mixture into soup. Check the seasoning for saltiness and adjust salt measurement if needed. Add pickle juice, Old Bay, salt, pepper and cayenne. Cook 5 more minutes and remove from heat. Serve immediately. Serves 6 - 8.
" If you like spice, use Proper's Pickle Slices with Habanero Chili.